1. Be careful when cooking Longhorns meat! Due to the low fat content of Texas Longhorns the beef cooks very quickly!!! Broiling: When broiling keep in mind the meat should be 3-4 inches away from the heat. Watch it carefully- Longhorn meat cooks very quickly!To keep the steaks juicy, broil them when their still slightly frozen. Grilling: When grilling Longhorns meat cook it over medium heat. For extra flavor cook the meat over damp mesquite or cherry wood chips. Ground Beef: Ground Beef should have an internal temp of 160º when done. 2. Since Texas Longhorns have very lean meat the cooked size is very similar the the size before you start cooking. 3. 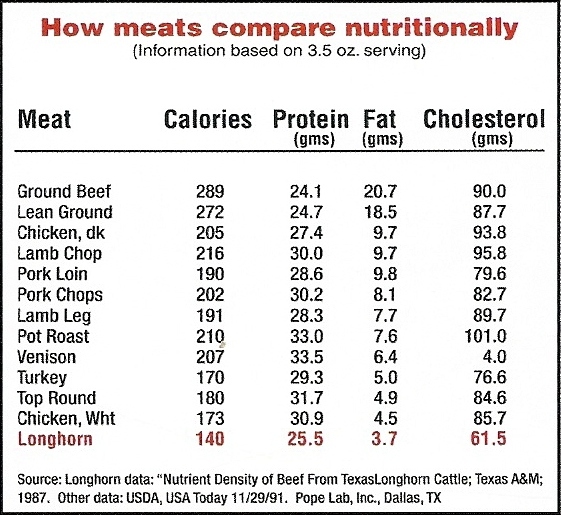 There is never a need to cook Texas Longhorn beef in additional fat. There's is plenty of natural fat to cook the meat.